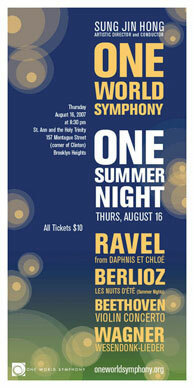 Join conductor Sung Jin Hong and One World Symphony for One Summer Night, including works by Ravel, Berlioz, Beethoven, and Wagner. In Ravel's Daphnis et Chloe Suite No. 2, the music begins with one of the most captivating depictions of nature, continues with a stunning pantomime between the lovers, and mounts to an arousing conclusion. Deeply expressive, Beethoven's violin concerto employs a sensitive solo violin and the orchestra tenderly entwined. Considered to be the first song cycle for orchestra and voice, Berlioz's love songs Les Nuits d'ete embrace one's inconsolable longing during dark moonlit summer nights. Wagner's passionate and intense Wesendonk Song Cycle may have been inspired by his infatuation to Mattilda Wesendonk. Wagner called two of the songs in the cycle Im Treibhaus (In the hothouse) and Träume (Dreams) "studies" for Tristan und Isolde using for the first time musical ideas that are later developed in his revolutionary music drama.